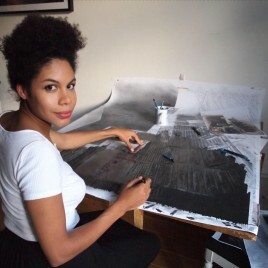 Catherine Anyango Grünewald is a Swedish/Kenyan artist. She studied at Central Saint Martins and the Royal College of Art, followed by a Masters in Modern Literature at UCL. She has published, lectured and exhibited internationally. In 2010 her graphic novel adaptation of Joseph Conrad’s Heart of Darkness was published to critical acclaim. Catherine uses film, sculpture, drawing and mise-en-scene devices to produce work which looks at physical or domestic environments being disrupted by emotional, intangible phenomena. Her drawing work uses the materiality of drawing tools to explore meaning, exploiting the physical properties of soap, pencil and eraser on paper to convey sensitive and complex themes. The process and labour invested in the work is a direct homage to the subjects, victims of violent domestic or institutional crimes. Catherine lives and works in Sweden, having moved from London where she taught for ten years at the Royal College of Art. She is now a Senior Lecturer at Konstfack, in Stockholm.